Twitter boasted that the number of daily junk tweets and blatant spam profiles have been reduced to almost one percent. In a blog posted Tuesday Twitter displayed a graph that spans from February 2009 to February 2010 showing the rise and fall of garbage tweets clogging the micro-blogging site. "Posting harmful links to phishing or malware sites, repeatedly posting duplicate tweets, and aggressively following and un-following accounts to attract attention are just a few examples of spam on Twitter. Like it or not, as the system becomes more popular, more and more spammers will try to do their thing. We're constantly battling against spam to improve the Twitter experience and we're happy to report that it's working," Twitter wrote in its blog. 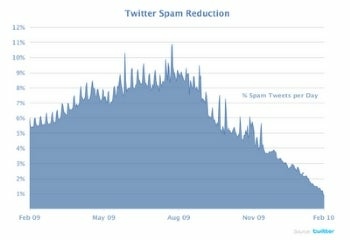 The graph, however, contains no actual numbers, and Twitter does not detail how it has reduced spam. Twitter is undeniably popular -- clocking in 50 million tweets per day -- and with Internet esteem comes spammers attempting to phish, scam and annoy. The site works hard at reducing spam, providing users with a guide and a call-out button to report spam. Twitter has also begun screening some hyperlinks for phishing activity. In addition, there are three helpful rules you can implement yourself that'll streamline your Twitter experience and eliminate obnoxiousness.